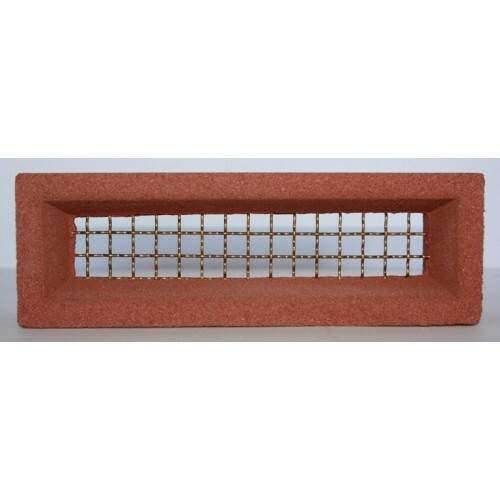 230 x 75 mm vent, with decorative 11mm x 11mm crimped brass wire mesh, Hi flow static vents. They give 5,100 Sq mm of ventilation per vent. The Australian Building code 3.4.1 deals with sub-floor ventilation. There are 3 climate zones, Zone 1 is central Australia and requires 2,000 sqmm of ventilation per linear metre of external wall, using Aleta 230 x 75 vents in Zone 1 would mean spacings at 2.6 metres. Zone 2 is in land Australia and requires 4,000 sqmm of ventilation per linear metre of external wall, using Aleta 230 x 75 vents in Zone 2 would mean spacings at 1.3 metres. Zone 3 is coastal Australia and requires 6,000 sqmm of ventilation per linear metre of external wall, using Aleta 230 x 75 vents in Zone 3 would mean spacings at .85 metres. It should be noted that extra ventilation may be required if : excessively damp sub-floor or if all walls can't be ventilated. Vents should be placed no more than 600mm from corners and evenly spaced around the building.